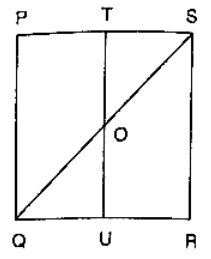 In figure, compute the area of quadrilateral ABCD. In figure, PQRS is a square and T and U are, respectively, the midpoints of PS and QR. Find the area of ΔOTS if PQ = 8 cm. In figure, ∠AOB = 90°, AC = BC, OA = 12 cm and OC = 6.5 cm. Find the area of ΔAOB. 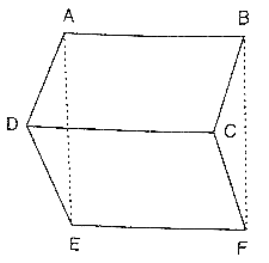 In figure, ABCD is a trapezium in which AB = 7 cm, AD = BC = 5 cm, DC = x cm, and distance between AB and DC is 4 cm. Find the value of x and area of trapezium ABCD. AL = BM = 4 cm and LM = 7 cm. In figure, OCDE is a rectangle inscribed in a quadrant of a circle of radius 10 cm. 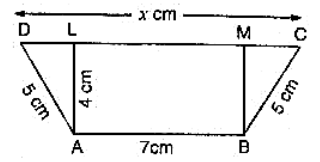 If OE = 2√5 cm, find the area of the rectangle. In figure, ABCD, ABFE and CDEF are parallelograms. Prove that ar(ΔADE) = ar(ΔBCF). Diagonals AC and BD of a quadrilateral ABCD intersect each other at P. Show that: ar(ΔAPB) × ar(ΔCPD) = ar(ΔAPD) × ar(ΔBPC). 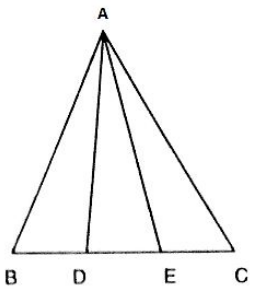 In figure, ABC and ABD are two triangles on the base AB. 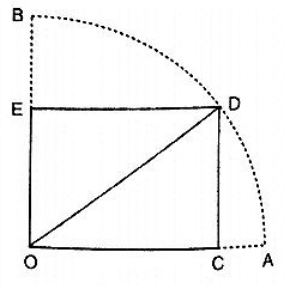 If line segment CD is bisected by AB at O, show that ar(ΔABC) = ar(ΔABD). To prove: ar(ΔABC) = ar(ΔABD). Construction: Draw CP ⊥ AB and DQ ⊥ AB. 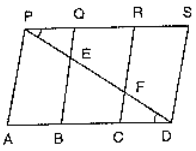 If P is any point in the interior of a parallelogram ABCD, then prove that area of the triangle APB is less than half the area of parallelogram. If AD is a median of a triangle ABC, then prove that triangles ADB and ADC are equal in area. If G is the mid-point of the median AD, prove that ar(ΔBGC) = 2ar(ΔAGC). A point D is taken on the side BC of a ΔABC, such that BD = 2DC. Prove that ar(ΔABD) = 2ar(ΔADC). To prove: ar(ΔABD) = 2ar(ΔADC). 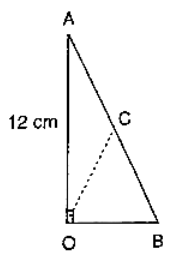 We know that median of triangle divides it into two equal triangles. ∴ In ΔABD, AE is the median. In ΔAEC, AD is the median. (i) In ΔDAC, since DO is a median. (ii) In ΔBAC, since BO is a median. In ΔPAC, since PO is a median. Subtract equation 2 from 1. 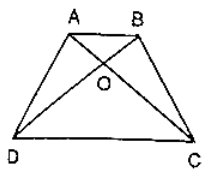 ABCD is a parallelogram in which BC is produced to E such that CE = BC. AE intersects CD at F.
(i) Prove that ar(ΔADF) = ar(ΔECF). 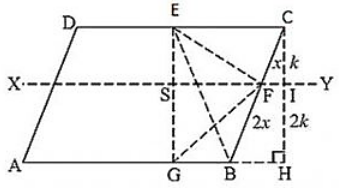 (ii) If the area of ΔDFB = 3 cm2, find the area of ∥ gm ABCD. ⇒ ar(ΔADF) = ar(ΔECF) and DF = CF . ⇒ BF is a median in Δ BCD. 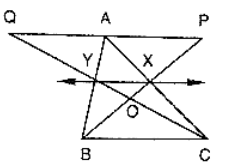 ABCD is a parallelogram whose diagonals AC and BD intersect at O. A line through O intersects AB at P and DC at Q. Prove that ar(ΔPOA) = ar(ΔQOC). ABCD is a parallelogram. E is a point on BA such that BE = 2EA and F is point on DC such that DF = 2FC. 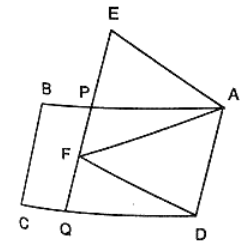 Prove that AECF is a parallelogram whose area is one third of the area of parallelogram ABCD. (ii) ar(ΔPRQ) = 1/2 ar(ΔARC). (iii) ar(ΔRQC) = 3/8 ar(ΔABC). We know that each median of a triangle divides it into two triangles of equal area. Since RQ is the median of ΔRBC. 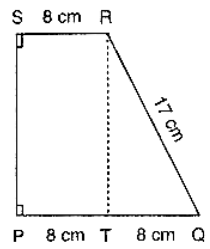 (v) Find what portion of the area of parallelogram is the area of ΔEFG. (ii) ar(ΔEGB) = (1/6) ar(ABCD). (iii) ar(ΔEFC) = (1/2) ar(ΔEBF). Hence, ar(ΔEFC) = (1/2) ar(ΔEBF). (v) In the figure it is given that FB = 2CF. Let CF = x and FB = 2x. Now consider the two triangles CFI and CBH which are similar triangle. In figure, CD ∥ AE and CY ∥ BA. Since, triangle BCA and triangle BYA are on the same base BA and between same parallel s BA and CY. In figure, PSDA is a parallelogram in which PQ = QR = RS and AP ∥ BQ ∥ CR. Prove that ar (ΔPQE) = ar(ΔCFD). (iii) ar(trap. DCYX) = (9/11) ar(XYBA). (i) Join DY and produce it to meet AB produced at P.
(iii) Since x and y are the mid points of Ad and BC respectively. Given that ABC and BDE are two equilateral triangles. Therefore, ar(ΔBDE) = 1/4 ar(ΔABC). Trinagles BAF and BEC are on the same base BE and between same parallels BF and AC. Triangles BED and AED are on the same base ED and between same parallels AB and DE. 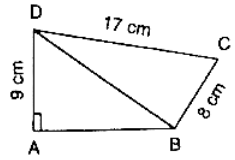 (vi) Let h be the height of vertex E, corresponding to the side BD in triangle BDE. 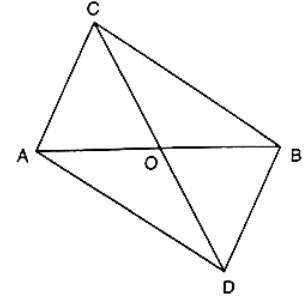 D is the midpoint of side BC of ΔABC and E is the midpoint of BD. If O is the midpoint of AE, Prove that ar(ΔBOE) = (1/8) ar(ΔABC). In figure, X and Y are the mid points of AC and AB respectively, QP ∥ BC and CYQ and BXP are straight lines. Prove that ar(ΔABP) = ar(ΔACQ). Since X and Y are the mid points of AC and AB respectively. We observed that the quadrilaterals XYAP and XYAQ are on the same base XY and between same parallels XY and PQ. 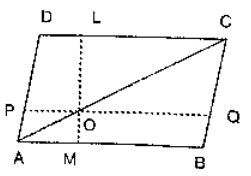 In figure, ABCD is a parallelogram. O is any point on AC. PQ ∥  AB and LM ∥ AD. Prove that: ar(∥ gm DLOP) = ar(∥gm BMOQ). Since AO and Oc are diagonals of parallelograms AMOP and OQCL respectively. ar(∥gm DLOP) = ar(∥gm BMOQ). (i) Clearly triangles LMB and LMC are on the same base LM and between the same parallels LM and BC. (ii) We observe that triangles LBC and MBC are on the same base BC and between same parallels LM and BC. 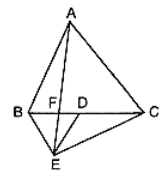 In figure, D and E are two points on BC such that BD = DE = EC. Show that ar(ΔABD) = ar(ΔADE) = ar(ΔAEC). Draw a line l through A parallel to BC. We observed that the triangles ABD and AEC are on the equal bases and between the same parallels l and BC. Therefore, their areas are equal. 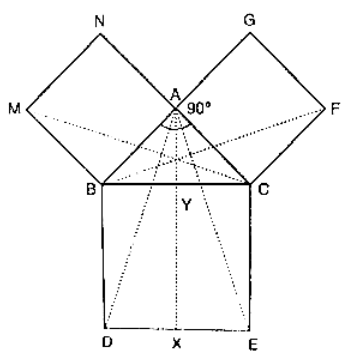 Hence, ar(ΔABD) = ar(ΔADE) = ar(ΔAEC). (ii) Clearly, triangle ABC and rectangle BYXD are on the same base BD and between the same parallels AX and BD. (iii) Since triangles MBC and square MBAN are on the same base Mb and between the same parallels MB and NC. Clearly, triangle ACE and rectangle CYXE are on the same base CE and between same parallels CE and AX. (vi) Clearly, triangle FCb and rectangle FCAG are on the same base FC and between the same parallels FC and BG.